Title: 05/02/1989 - Consumer product exemption under the OSHA Hazard Communication Standard (HCS). This is in response to your letter of January 11, concerning the consumer product exemption under the Occupational Safety and Health Administration's (OSHA) Hazard Communication Standard (HCS). the coverage of any drugs regulated by the Food and Drug Administration in the nonmanufacturing sector. On August 19, 1988, the United States Court of Appeals for the Third Circuit ruled that OMB had exceeded its authority, under the Paperwork Reduction Act, in disapproving the three provisions of the expanded HCS. The court ordered OSHA to "publish in the Federal Register a notice that those parts of the August 27, 1987, Hazard Communication Standard which were disapproved by OMB are now effective." On September 2, 1988,the Department of Justice filed a petition for rehearing with a suggestion for rehearing by the entire third Circuit Court of appeals. The Court of Appeals denied the petition for rehearing (November 29, 1988), as well as requests for stay of the decision. In addition, a further motion by industry representatives for a stay of the decision was denied on January 24, by the U.S. Supreme Court Justice Brennan, and on February 17, by the full Court on reconsideration. The Solicitor general has filed a petition for a writ of certiorari on behalf of the government in the United Steelworkers case. Industry representatives also petitioned the Supreme Court for writs of certiorari in both the United Steelworkers case and in Associated Builders land Contractors, in which industry challenged the validity of the standard's application to nonmanufacturing employers. Those requests are pending. If certiorari is granted, the Supreme Court may ultimately decide the enforceability of these provisions. 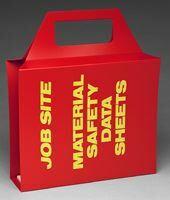 This portable job site MSDS binder is just one of many OSHA compliance items available from Safety Emporium. However, the Third Circuit's decision became effective January 30 of this year and OSHA complied with the Third Circuit order by publishing a notice in the Federal Register on February 15 announcing the effectiveness. All provisions of the HCS are now effect in all industries. Consequently, statements in the OSHA Instruction CPL 2-2.38B regarding the exemption of all consumer products are no longer applicable. Under the current rule, whenever a consumer product is not used in a manner similar to that of normal consumer use, resulting in a duration and frequency of exposure greater than consumers experience, the product is covered by the HCS. We hope this adequately responds to your concerns. If we can be of further assistance to you, please do not hesitate to contact us.